So, if you've ever felt that you could be getting more out of Office 365, or found yourself asking 'Should I upgrade to Office 365? ', take a look at the apps you can use to create a more effective workplace. We hope you enjoyed our Office 365 benefits and tips. 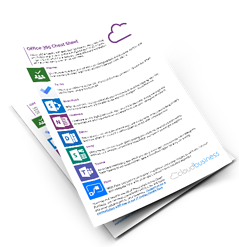 Our Office 365 tips sheet offers a quick overview of these apps and others you may not have heard of, to ensure you're using office 365 to its full potential. You can download your copy by hitting the button below.